In January’s article we talked a bit about how copyright, together with how and where images may be taken and published, are subjects which often cause confusion. As professional photographers it’s vital that we have an understanding of the law, but that understanding is just as important for amateurs and hobbyists, given the times we now live in. There are a great many discussions regarding the topic of Photographers Rights in the UK and it is true to say that in terms of where we can take pictures we may find ourselves in situations which we would not expect to encounter in other parts of the world. For example, we now live in a climate where virtually anybody with a camera can be held under suspicion of committing some unlawful or unspeakable act. Consequently the press is littered with countless distressing cases where those innocently engaged in the pursuit of photography are harassed by over-zealous and often ill-informed security guards, CSOs, members of the public and the police themselves – all believing they understand the laws governing what a person is entitled to do with their camera and ultimately how the photographer may use those images. It does little to help public confidence when those in authority often lack the necessary legal knowledge and training, resulting in the interrogation of those who are simply enjoying their hobby. We must all observe and respect the fact that certain sensitive inner city areas are now photography-free-zones in the name of public safety, and photography is not always allowed on private land, but in general the frenzy of mistrust which has been whipped up in recent years defies any sense of logic and is not the mark of the free-thinking democracy we were once so proud of. Laws do vary depending on your jurisdiction, and this discussion relates to the laws of England and Wales. It is not supposed to be definitive legal advice and should not be taken as such. I cannot enter into private discussions on any issues you may be experiencing and it is important to consult a lawyer in your geographical area regarding any matters on which you’re unclear, or which affect you or your business. A full discussion of our legal rights is beyond the scope of this article (and I am writing from the perspective of social photography and the queries which generally arise from that). In a previous blog entry, we touched on the bare bones of copyright, so let’s now take a look at how the business of photography works. Like musicians, writers, designers, and other artists, photographers also decide who can use and reproduce their work. A client, who has instructed the photographer, doesn’t own the photograph(s) but instead usually pays for the photographer’s time and then buys finished products, often in the form of prints, albums, or wall-art. Or the client might be able to purchase a License giving them the right to use the prints or digital images on a DVD for certain specified purposes. It is illegal for any individual or organisation to use, scan, distribute, print, alter or otherwise reproduce any content without the express written consent of the creator. Copyright law applies whether the creator is a paid professional, a casual hobbyist, or a friend e-mailing you some snapshots of your family. Many wedding photographers choose to sell their clients the rights to print high resolution photographs from a disc for that client’s personal use – this enables the client to print as many images as they like (at home or at a lab of their choice) and to send web-prepared images to friends or family via e-mail, or to display the pictures on a personal networking site like Facebook. A typical wedding disc (which might contain hundreds of full sized high quality images) is therefore likely to cost several hundreds of pounds, but this does mean the client can show the images to whoever they choose, without having to go back to the photographer whenever they want prints. Commercial and corporate photographers also sell their clients usage rights based on individual client requirements. For commercial work (for example photographs of the client’s objects, products, food, or property) the photographer will sell the client a License (separately to the fees for their time) which will reflect the intended purpose of the photographs – for example their use on the client’s website, in the client’s brochure or intranet, or in a trade magazine. A commercial License might also grant the client exclusive rights to those images for the specified timescale, so that no third party can have access to those images in that period. A commercial agreement may be worth several thousands of pounds, particularly if the images are to be used in large advertisements with a great many print runs. A fee must be calculated for each time an image is downloaded or printed and this is factored into the usage License (rather like a musician licensing their music for use on a website, or for use in a pub or restaurant). A good idea of what it costs to use a picture can be obtained by visiting the large stock agencies such as Getty or Alamy. Whatever the usage terms, copyright always remains with the photographer unless agreed otherwise (it would be very rare for copyright to be re-assigned to anyone else, an exception being ‘in house’ photographers where the organization employing them will usually own the pictures). If I’ve paid for the photographer, do I own the pictures? No. Paid or unpaid, the photographer owns every image they take. Unless you have a specific document granting permission (a License) it’s illegal to copy or modify any piece of work. Concerning images captured in locations where there can be no reasonable expectation of privacy, the photographer does not need the permission of the individual(s) who appear in that photograph in order to publish it on their website, in a newspaper, textbook or in a magazine. The general term for such usage is ‘editorial’ and the photographer can pass on or sell their work for that purpose (and may use the images for the purpose of artistic expression). Good examples include news reporters, event photographers and of course paparazzi. The same rights extend to all photographers, amateur or professional. Contrary to what most people think, there is no separate law governing the taking of or publication of images of minors (providing the image is not used to depict the indecent exploitation of children). Images of people (or their property) may not be used in advertising without the subject’s consent (or the consent of a guardian if the subject is a minor). If a photographer passes those images to any business, and that business uses the images within their advertisements, then it could be argued that the people within the photograph are endorsing that product or service. For the same reason, permission should be gained before the photographer can pass those images to a Stock agency, who often sell images to businesses. Is it illegal for anyone, professional or not, to photograph children? No! There is a common and enduring misconception that it is illegal to photograph minors without parental consent. It is not illegal (providing the images are not indecent and you are not harassing your subject) and consent is not required. However it is certainly true that nowadays anyone taking pictures of children is likely to become an object of suspicion, photographers are frequently questioned by the police who often aren’t clear about the law themselves! The copyright holder is free to publish and sell images for artistic use such as postcards and art prints. However commercial usage (sale of images for advertising) advises the property owner’s permission. Photographers usually gain consent/release in advance of any shoot as a section within their Contracts or Terms of Business. There is currently no issue with photography in a public place (where there could be no expectation of privacy) nor is it a requirement that the photographer gain parental consent to include a child in the frame. As the law stands, a photographer does not need to gain the consent of anyone who appears in the frame, in the vast majority of cases that would not even be feasible, and I’m sure we’ve all been photographed in some way whilst we’re out and about. The photographer may sell their images, providing the pictures aren’t sold/passed on for the purpose of advertising something (this relates to prominently recognizable individuals rather than general crowd scenes). If the event takes place on private property where the site-holder prohibits photography (it will usually say this on the tickets or on the published Terms and Conditions) then no pictures can be taken without specific dispensation. Some concerts and museums are an example of this. As opposed to personal and recreational photography, and photographs which would be classified as artistic, educational, or newsworthy – photography which is specifically “commissioned for private and domestic purposes” should not be published without the consent of the Commissioner (client). Given that professional photographers need to be able to show recent work in order to gain new customers, professional wedding and portrait photographers will normally include a clause within their standard contracts which will state that the photographer reserves the right to use the images (which belong to the photographer by law) for publication and promotional purposes. The client has the right to restrict this, but it is also reasonable for the photographer to refuse to accept such a request – in which case the photographer would have to refuse to work with that customer. In other words, the client has the right to strike the clause from the contract, but the photographer equally has the right to reject the customer. Therefore in progressing with the photographer’s services the client has given consent for the photographer to place the images on their website etc. In fact it would be extremely unusual for a client to refuse to allow the photographer publish the work, and in general that would only tend to happen if military personnel were involved, or celebrities. So let’s say that the usual situation prevails and the bride and groom are looking forward to their photographer publishing their wedding photographs – after all this is a very convenient way of showing the images to workmates, friends and family members who might not be attending the event. Responsibility for such consent lies with the “data controller” – the person who determines the manner in which the photographic data is utilised. It can be argued that the client (the bride and groom) by arranging the event and consenting to the images being used, act as the data controllers. It can also be argued that the photographer is the data controller. Whilst no one individual can necessarily sign away the rights of any other individuals, people at a wedding nevertheless expect to be photographed and there is no issue of privacy. Wedding guests should expect that the images will be published and seen by others. If wedding guests and attendees feel strongly about photographs containing their likeness being published by guests and by professional photographers they can absent themselves from the image making process, although this will be very difficult at an event like a wedding, where almost everyone will have a camera in their hand. The same principle exists whenever we, the public, attend any other kind of special event (such as a local fete, show, display or fund raiser) – the person or body who is holding the event would be described as the “event controller” and it is they who determine the schedule, terms of entry, and who is entitled to attend. Such events very often have a professional photographer in attendance, or a photographer from the local press. Providing the attendees are aware that photography is taking place (awareness could be in the form of a statement on the ticket, a sign, or the fact that the professional photographer makes their presence known) and that the images will be used for publication, promotion, and any other reasonable purposes, then they are deemed to have consented. Therefore, by being informed, and by understanding the purpose of the photographer, the attendees (or members of the public) grant implied and informed consent to their appearance in photographs which are likely to be made public in a variety of ways. This is why in recent times it is often increasingly irksome for wedding photographers when they are contacted by wedding guests who are requesting that the photographer removes images containing their child or family from the photographer’s website or blog. Whilst the majority of photographers will be quite happy to respond as asked if it is just the odd image, the matter becomes unwieldy and in many ways unacceptable if that guest is demanding that every image they or their child appears in is taken down. And of course the photographer’s clients, the bride and groom, expect photographs from their wedding to be published for the enjoyment of others, so the service offered to the client is also being compromised. Unless you’re the photographer (copyright holder) you can’t pass the photos (in any format) to anybody for use in connection with a business or service, nor can you distribute copies of the disc or any images on it. This is because the images are licensed to you, the client, for personal use only. You’ll need to ask the vendor to contact the photographer who’ll be happy to help. The images are the property of the creator, who holds title to their work. However if a person has commissioned the photography for private or domestic use (s.85 of the Copyrights Patents and Designs Act 1988) then they, the client, do have certain rights and they may request prior to booking their session that the images are not published or displayed to the public. As I’ve already mentioned in the wedding question, it is normal for portrait and wedding photographers to have clauses built into their Contracts stating that they, the Copyright holder, reserve the right to use their photographs within their portfolios, in magazines and for competitions etc – this is because photographers cannot get work unless they have recent or relevant images to show to prospective customers. If the client’s circumstances are particularly sensitive the photographer must be informed prior to commencement of the sitting (or wedding) so that the clause can be amended or removed from the Contract (or the photographer might advise the client to go elsewhere if the terms are not negotiable). Where the client was made aware of the existence of the terms (irrespective of whether he/she actually reads them or not) and has commenced with the photographer’s services, then the client is bound by the terms they have agreed to. They form part of the contract between the client and the photographer. So the client could not insist, after the fact, that the photographer couldn’t use the images for those purposes. It is extremely unusual for a client to ask their photographer not to display the images from their shoot or wedding, such exceptions normally only arise where the subject(s) are military personnel or where the subject(s) are involved in sensitive legal proceedings. Your License is specific only to those parties named on it. Unless your License specifies otherwise, you cannot distribute copies of the disc (or any images) to anyone else (but it’s reasonable to make your own backup). As the License-holder (unless your document says otherwise) you’re free to make as many prints as you want, wherever you want. But you can’t in any manner profit from the photographer’s work, or do anything which may circumvent sale. Many clients still prefer to come back to their photographer for special re-prints or artwork, because the quality of prints from most public providers doesn’t match those from a professional-only laboratory. You’ll have to speak to your photographer, because displaying the images in any manner which promotes your goods (whether you bought prints or a DVD of images) will constitute commercial use. Your photographer will draw up a new arrangement and will advise of the fee. You’ll also need to get signed permission from the other (recognisable) people who appear in the pictures (even if they’re family members) because their likeness is being used to promote something. This is the responsibility of you, the business owner. Incidentally, if you want to play your favourite music in your place of business (such as a bar, cafe, restaurant, website or studio) you’ll need to obtain a user license in exactly the same way. It’s illegal to use photographs to which you do not hold title (even if you or your property are the subject of the image). This includes taking copies of images from people’s websites. Contact the owner and ask their permission first. However, it’s perfectly OK to place a link to their website instead. Why are web-sized images watermarked? Photographers often license digital images to their clients, and sometimes a set of full-resolution pictures will be accompanied by a folder of files which have been specially prepared for the web. These are small images which have been specially optimized for web-viewing, such as transmission in e-mails or display on forums, personal websites, or networking sites such as Facebook. Because we don’t want other people claiming our work, photographers will place their name or studio reference on these images. It’s our policy that only watermarked pictures can be transmitted on the web by our clients, and in fact we only put watermarked files on our Blog. It’s illegal to alter the copyright holder’s work. This means you can’t make any changes to the images because they’re the photographer’s property. You can’t turn them to black and white, or apply any special effects, but overall resizing is usually permitted. Talk to your photographer if you’d like different versions of the files. I took some prints and a DVD of images to a high street print shop but they won’t print or scan them for me – why? If you didn’t take the pictures yourself, the lab is obliged to check that you have permission to make copies of them. If you’ve purchased digital images the usage License which accompanies them will detail how the files can be used, and you’ll need to show this document to your lab as evidence that it’s OK for them to make the prints. This is not the fault of your photographer. Print quality varies considerably and photographers can’t take responsibility for the quality of the prints from a home printer, or that of any other print shop or lab. We can only guarantee the results from our own labs, because we carefully profile the images to match that lab’s output requirements. Photographers process their images on properly calibrated computer monitors and they use special professional-only laboratories, so that the pictures come back looking exactly as they should. It’s very unlikely that any client’s home monitor or printer is set up in this way, so colours and particularly skin-tones can sometimes appear wrong both in print and on the screen. The same can be said for the results from many high street print services, so it’s really important to get some recommendations on where to take the images. For anything big or special, it’s usually best to go back to your photographer. Under no circumstances ‘tweak’ the colours of the pictures – not only is alteration illegal under copyright law, the files will be ruined and the photographer will have no obligation to replace them if they’re overwritten with the new changes. On legal matters clarification can also be obtained from the Home Office/Information Commissioners Office. UPDATE 1: As of 2018 we have seen the introduction of GDPR laws. This makes no practical difference to the matters discussed here, additionally photography clients enter into a specific contract with their photographer. Client data such as addresses, email details etc must be handled in accordance with the law. GDPR concerns itself with biometric data. However stock and editorial photographers will need to take care when publishing images which contain information which might identify any clearly recognizable person. In this instance it’s best to gain consent. UPDATE 2: I write this addendum in December 2018. Prior readers of the blog will have noticed some changes to how the website looks. It’s now fully responsive in terms of how it displays on mobile devices. The previous website was designed using ProPhoto 5 software around seven years ago. P5 isn’t responsive and it isn’t fully compatible with the new WordPress 5.0 update which has just been released. So my option was to stay with WordPress and try to figure out a totally different responsive theme (which would require a fiddly full site re-hash) or move away from WordPress entirely to a lower maintenance platform, and a less complex interface. I took the latter option and rebuilt the site on Squarespace. 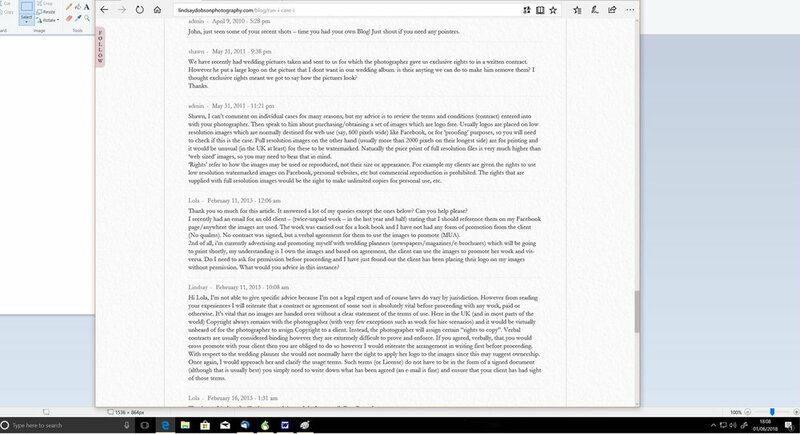 But the move meant we couldn’t bring our comments sections with us (hence adding them in below as screenshots). Some useful educational points have been raised in the comments, which may be useful to some of you should you want to read them. 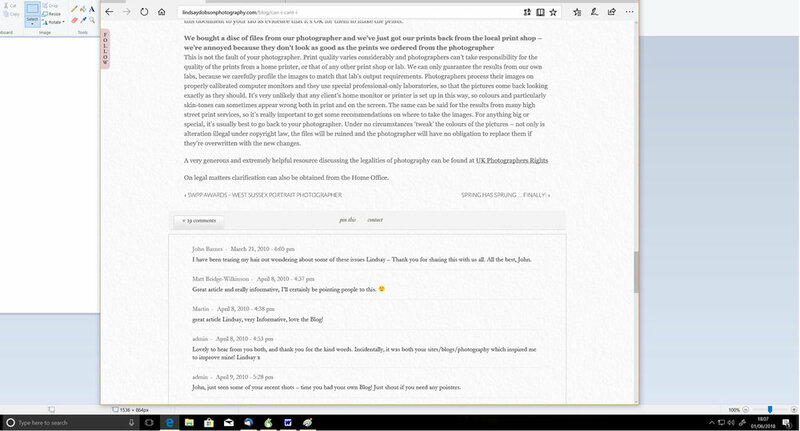 Screenshots of the Comment section from this post as it appeared on my old Wordpress site.